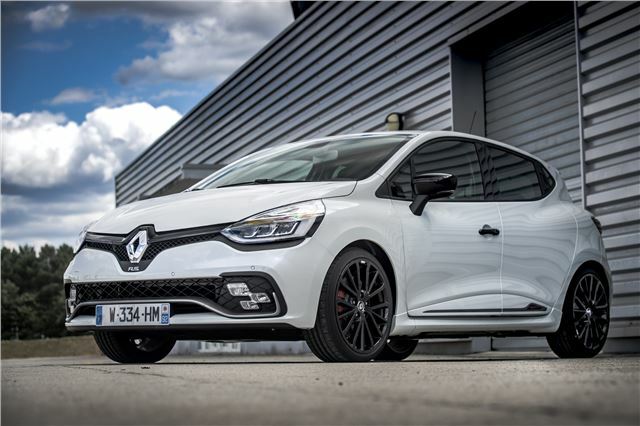 Like the standard Renault Clio, the Clio RenaultSport has been getting a revamp, and this applies to both the 200PS ‘200’ and the 220PS 220 Trophy version. 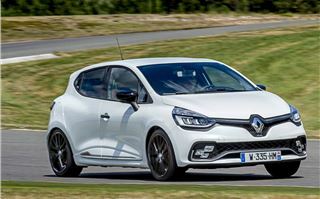 The price of the 220, still the only small hot hatch with a 6-speed EDC transmission, is £22,030. 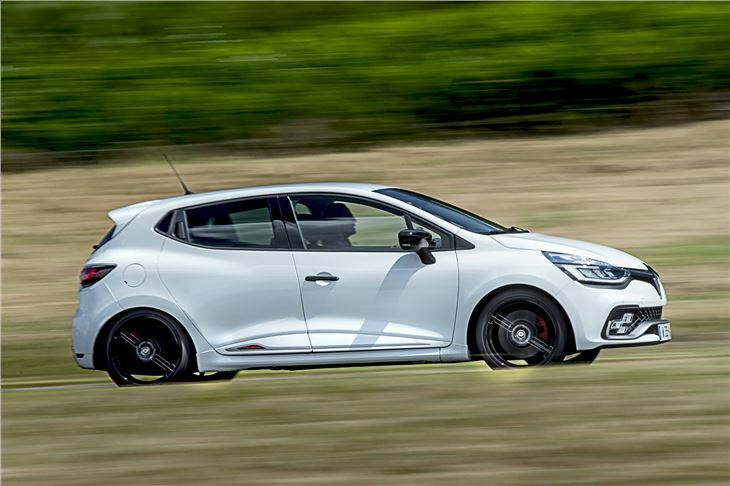 This undercuts the substantial £22,745 being asked for the 200PS Ford Fiesta ST200. And it gets you a lot of kit. Most notably the new R.S. 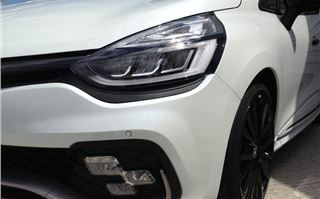 Vision LED lighting system. 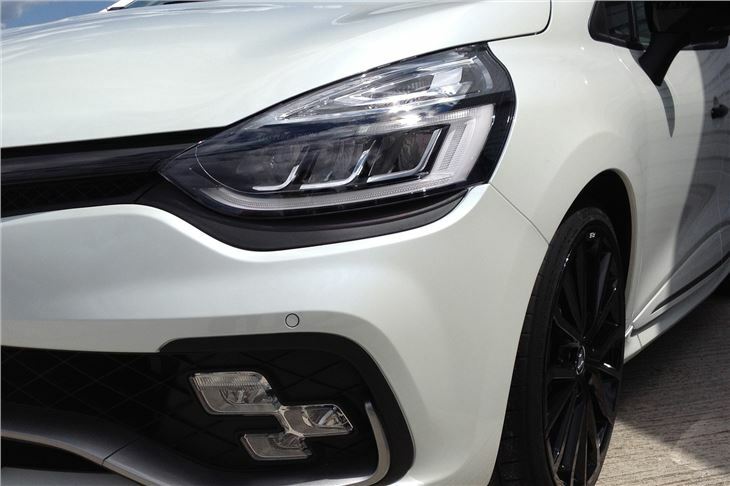 This co-ordinates the car’s fog lights, cornering lights, side lights and main beams to improve illumination by 40%. 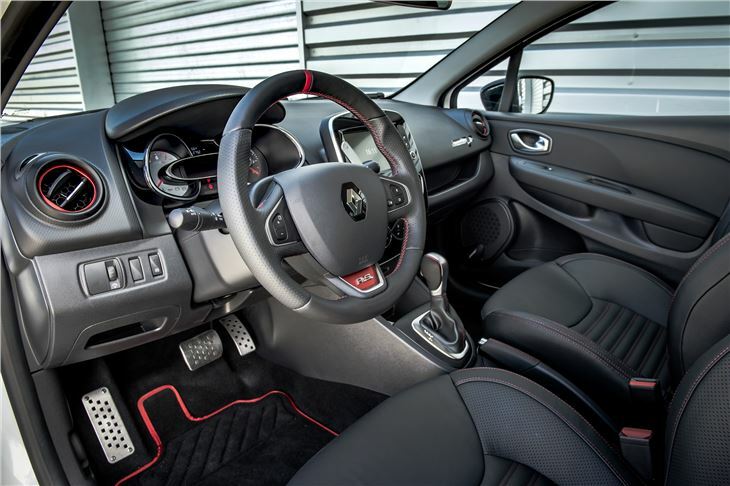 The standard £19,830 Clio RenaultSport 200 comes with RS Drive, RS Diff, hand-free keycard, button start, aircon, 6 airbags, cruise control, speed limiter, automatic headlights and wipers, rear electric windows, MediaNav multimedia pack with 7-inch touchscreen, Nav ‘n Go satnav, 3 x 20w Arkemys sound system, Bluetooth, USB port, handsfree, Renault Bass Reflex system and fingertip controls. 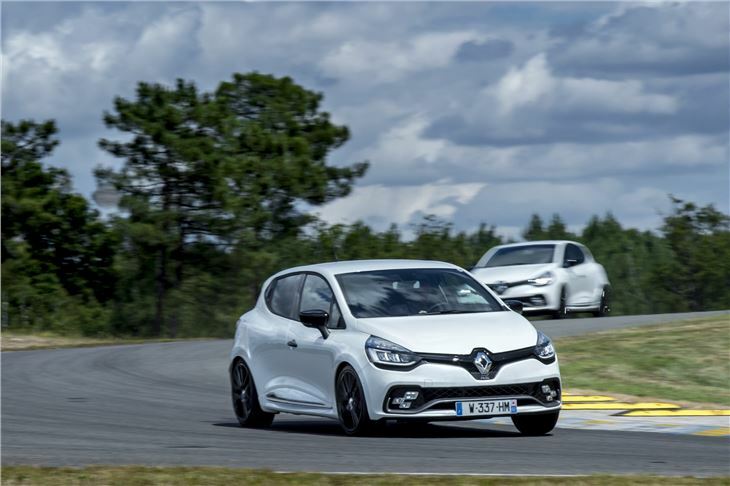 The Clio RenaultSport 220 Trophy adds 10% more power, less exhaust backpressure, 20Nm more torque, 50% faster EDC shifts, 30% shorter travel paddleshifts, RS Drive with Normal, Sport and Race modes, Launch Control, Cup chassis lowered by 20mm at the front and 10mm at the rear, 40% stiffer rear springs, RS electronic limited slip diff and 18-inch wheels with 205/40R18 Michelin Pilot Supersport tyres. Obviously, the fun bit is the three mode RS Drive. 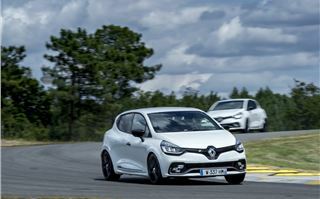 Pushing the Sport button transforms the car from soft road to ‘safe-track’ mode, sharpening accelerator response, giving an audible shift up warning, faster gearshifts, firmer feel to the steering and with the ESC allowing some controlled sliding. Slapping the floor lever over to manual (while left foot braking) and holding the button down for 5 more seconds selects ‘Race’ and switches the system entirely to manual with the ESC and ASR fully disconnected. Just don’t forget to change up. The circuit we used had a very long, downhill, off camber right-hander that tightened up and corkscrewed the car. The way it hung on through there at fairly extreme angles was very impressive as well its feedback and benign handling right on the limit of adhesion. 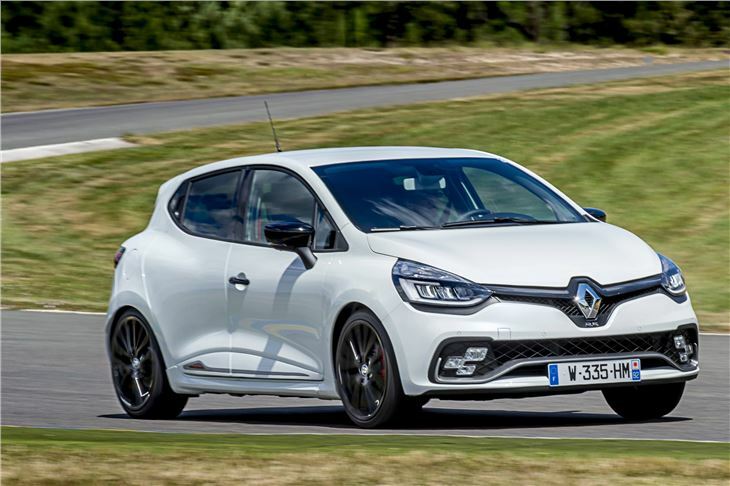 Much thanks, of course, to its Michelin Pilot Supersport tyres. But I don’t think any of its competitors have quite the same clingon factor. The uphill right hairpin was less impressive because in ‘Sport’ it was hard to left foot brake and drop it into 2nd. Probably the ESC taking over. 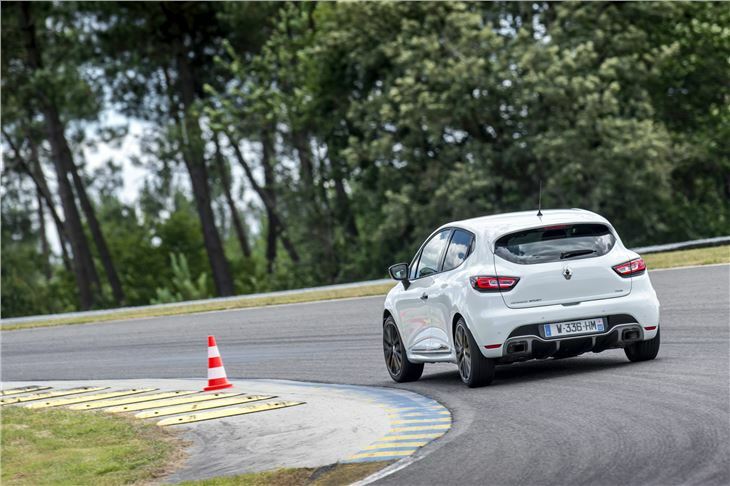 In other corners, it simply flowed through the braking points and apexes. Very confidence inspiring. Unfortunately, we only got 3 laps and no time to play with ‘Race’ mode, but anyone buying one of these for the occasional track day is going to have a ball. I didn’t miss having a manual shifter one bit. It’s not unrefined either. Normally it’s not too noisy, but you can get it to pop a bit, and, using the R-Link system, you can play about with the exhaust sound track that reproduces the sound of past Renault high performance cars such as the Alpine A110, and plays it back through the speakers. 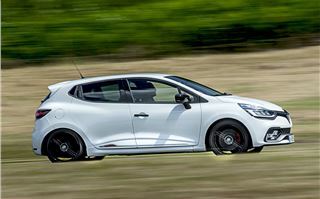 Up against the Ford Fiesta ST, Peugeot 208GTI, VW Polo GTI and SEAT Ibiza Cupra, the Clio RenaultSport 200 and 220 Trophy offer 5-door practicality and the advantage (or disadvantage) of automatic EDC transmission coupled with extremely well sorted handling and grip. 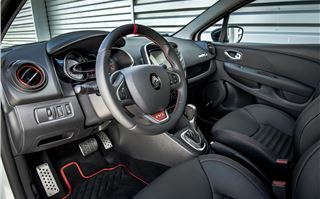 Die-hard Fiesta ST owners won’t give it a second look, but keen drivers will prefer it to the 208, the Polo and the Ibiza for its superior grip, while anyone with a wife and kids to accommodate won’t feel in the least bit short-changed.